Please call 866-737-7247 to order or email questions to Info@DeltaOxygenSystems.com. Gas cylinders only supply enough gas until the system equalizes. In many cases, there may be 500-1000 psig of unused oxygen returning to your supplier. Now you can reclaim the oxygen you have purchased by using our Oxygen Booster compressor to transfer low pressure oxygen into supply cylinders to 2100 psig. Oxygen cylinders can now be pumped down to 200 psig. Cost savings on oxygen pays for the booster in generally less than two years. Oxygen can be transferred to another small or high volume cylinder with various transfer hose assemblies as required for each different application. The compressor unit is designed to be mounted on a wall, bench, or on a portable cylinder cart, so it can be operated safely in an office or remote location. 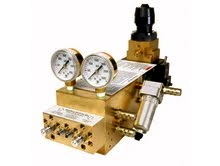 Unit operates by low pressure shop air or an optional nitrogen drive. Cylinder regulator for inlet gas is recommended. Compressor is compact and weighs only 50 pounds. Integral circuit design with no external fittings or plumbing. Inlet and outlet automatic pressure settings. DOS-300 offers efficient use of low pressure oxygen, less man hours for cylinder service and reduced cylinder inventory.